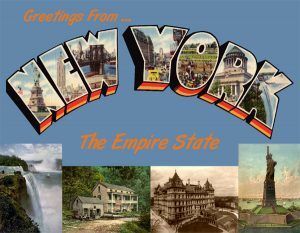 Greetings from New York Postcard, available at Legends’ General Store. From the shores of Long Island to the mighty Niagara Falls, the Empire State provides a wealth of history and attractions including 22 National Parks, 178 State Parks, and 262 National Historic Landmarks, not to mention numerous opportunities to explore the natural environment at beaches, hiking trails, forests, and mountains; as well as the flair culture, arts and foods in its many cities. First inhabited by various tribes of Algonquian and Iroquoian speaking Native American tribes, it began to see settlers when the Dutch moved into the region in the early 17th century. First claimed by Henry Hudson, Fort Nassau was built near the site of the present-day capital of Albany in 1614, and soon established New Amsterdam in present-day New York City, as well as parts of the Hudson River Valley, establishing the colony of New Netherland. 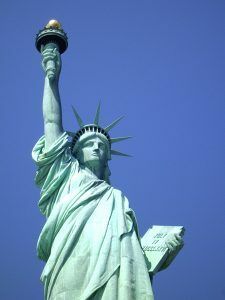 Today, New York is the third most populous state in the Nation, with New York City, having a population of over 8.1 million, as the the most populous city in the United States. Both the state and its largest city were named for the 17th century Duke of York, James Stuart, future James II and VII of England and Scotland. There is much to experience in New York, and you won’t be disappointed. Enjoy your travels in New York and welcome to the Legends of the Empire State. 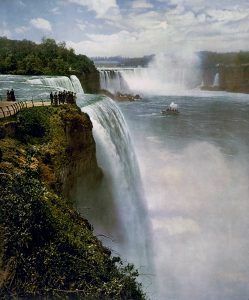 Niagara Falls from Prospect Point, William Henry Jackson, Detroit Publishing Co,around the turn of the century. Photo by the Detroit Photographic Co.